A new day of reckoning is upon us as communicators. A new reminder to commit to clarity and watch our words. No more utilising, away with leveraging; triage be gone. Time to drop the jargon, especially if you regularly communicate with the wider community about health. Yesterday was Drop the Jargon day, a new awareness day conceived by the Centre for Cuture, Ethinicity and Health to encourage health communicators to use Plain English. The Centre provides advice and training with the aim of removing cultural, linguistic and educational barriers to accessing health care. Their appeal to health professionals, community services and local government to pledge allegiance to the tenets of Plain English is not simply a matter of access to information – our understanding of health information impacts wellbeing because it affects our ability to make informed decisions and influences our actions. In a 2013 we blogged about the rising tide of protest against public language that is mostly written to manage risk and avoid accountability, and the slow creep of management jargon and officialise into everyday conversation. Dropping jargon where possible was one of the five pointers we offered for writing more clearly for the widest possible audience. As professional communicators, we know that it’s not always that easy in practice. 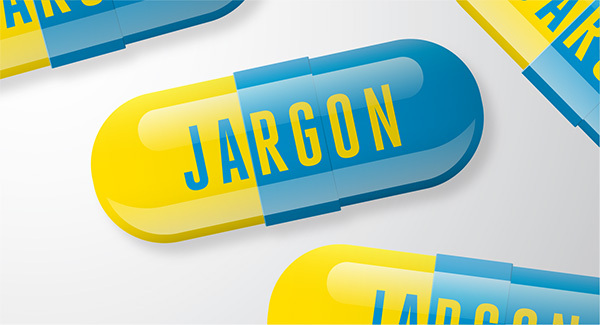 There are reasons why individuals and organisations hold-on to jargon: it can be a security blanket, a cultural tradition or badge of honour within a select club. Jargon can also be attractive for subject matter experts as an efficient shorthand rich in complexity and nuance. This seems to align with the Plain English call for concision – but in the battle between concision and clarity, we’re backing clearer sentences over shorter ones. A 2007 plain language thesaurus jointly published by the American Department of Health and Human Services and the Centers for Disease Control and Prevention provides many useful alternatives for words that plague the world of health: instead of metabolise, it suggests ‘convert food into energy’; for pathogenic, ‘disease causing’ is offered as a clearer alternative. In our years of experience focus testing health messages with community groups, choice of words and tone of voice are a big influence on how people understand and interpret information. (We have also yet to tame the rabble of Latin- and Greek-derived words that can confuse patients such as multigravida, perinatal, antenatal.) In the context of medical consultations and patient literature, Plain English can make the difference between relatable advice that is taken to heart and a confusing or condescending monologue that is soon forgotten or simply discarded.